When I first started writing fiction, I didn’t understand why authors often only publish a book a year, two if they’re prolific. Several of my favorite authors publish even more infrequently than that, much to my chagrin. I can write a first draft in three months easily. What takes so long? I started revisions. Now I understand. Editing is taking FOR-EVE-R. Okay, it’s been six weeks, but it feels like an eternity. Part of the problem is that I have made a lot of common newbie errors that aren’t just in a scene or two, they’re pervasive. In hopes that I might save others from my revision torture, I thought I’d list the top seven mistakes that have sucked up the most time. Seem/Appear/Suppose/Guess. I seem to appear very wishy-washy when writing. I guess my characters should just do things instead of seeming to do things, I suppose. Yuck! 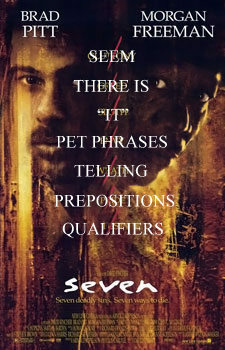 There is/There are. Starting a sentence with these words isn’t grammatically wrong, but it isn’t precise or interesting, either. “It” as subject. You can use “it” as the subject and be perfectly fine, but often when I do, my “it” is very vague. For example, I had a few different variations of this sentence: “It was getting dark.” Twice I meant the sun was setting, once I was referring to the lighting in a room, and another time a character was blacking out. My “it” was so vague as to make the situation unclear. Pet phrases. I know I’m not supposed to use clichés, but there were certain phrases I used often enough that they got just as annoying. I didn’t notice them while writing, but when rereading my chapters over and over, they began to make themselves known. I think I used the phrase, “for a moment” at least once a chapter. I’ve started keeping a list of my pet phrases, so I can do a search for them. Telling with dialogue. My problem wasn’t so much with the dialogue itself as the mess I caused around it. For example, I knew I wasn’t supposed to write: “Surrender or I’ll shoot!” the hero said menacingly. Menacingly is an adverb, and those are no-no’s. Instead, I’d write something like: “Surrender or I’ll shoot!” the hero yelled. He shot the villain a look that was menacing. The second attempt is not any better than the first. I’m still telling you the hero is menacing without showing you the menace. As I’m editing, I have to change the line to read more like this: “Surrender or I’ll shoot!” The hero leveled the revolver to the villain’s chest and cocked the hammer. Preposition party. Prepositions are like rabbits for me. If I put two together in a sentence, before I know it, I’ve got three or four. I had one sentence with six. To say that things got ambiguous and hard to follow was an understatement. I’m trying to limit myself to two a sentence. What else should I be looking for? Is there something you do repeatedly? As much as I hate to drag out the revision process, I also want to do it right. What’s your best editing advice? But if I take out all of the ‘qualifiers’ my story is down to 37 words? Ugh, I know. I think my word count dropped by 1,000 when I took out that list of qualifiers. It was truly embarrassing. I just realized that last sentence had a vague “it” as subject. Curses!